UPDATE! 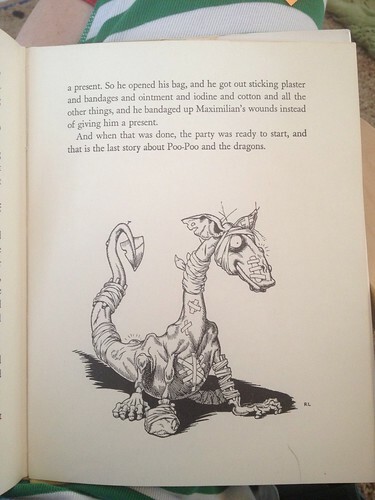 (June 17, 2014) A commenter has just let me know that you can now purchase an ebook of “Poo-Poo and the Dragons” with the original illustrations! So if you enjoyed my recording, please support this publisher and buy your own copy of this wonderful classic. 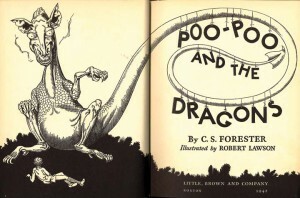 I just recorded and uploaded the last chapter of Poo-Poo and the Dragons! I’ll be podcasting about 2 chapters a week, but you can download the whole book right now if you’re impatient. Visit my “Kayray Reads to You” page. 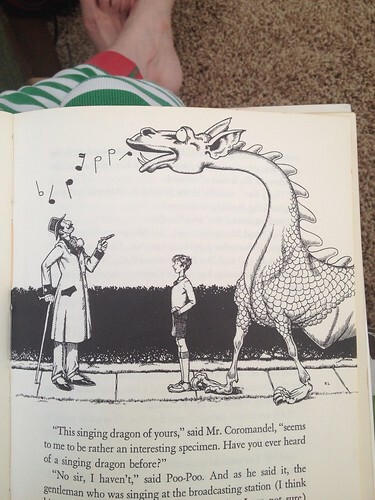 July 29 — Poo-Poo and the Dragons! Have I got a treat for you! 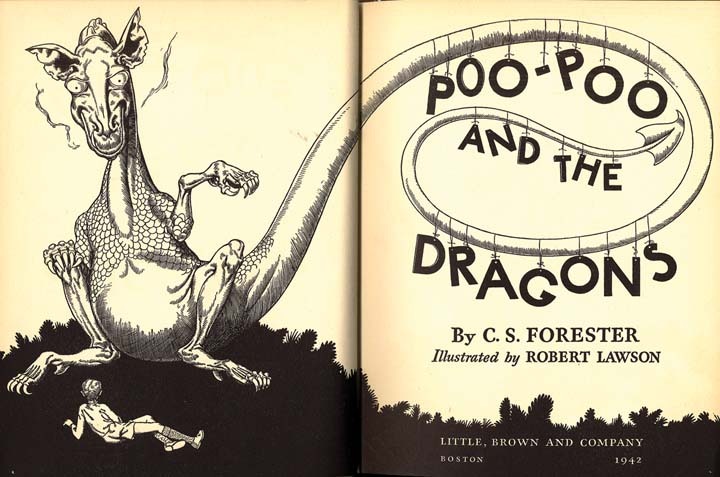 Chapter 1 of “Poo-Poo and the Dragons” by C. S. Forester (yes, the guy who wrote the Horatio Hornblower books). I’ve recorded 11 of 17 chapters but I have added the finished chapters to my podcast feed already. I’ll get the whole book done soon because I have to get it finished before the library wants it back. I don’t have my own copy because it’s out of print and used copies are rare and expensive. If you have a copy, hang on to it! The illustrations are by Robert Lawson. You would recognize his style — he illustrated Ferdinand! I hope you like the adventures of Harold Heavyside Brown (a.k.a. Poo-Poo) and his dragons! Instead of gifts for me, I am asking my friends, family, and audiobook fans to donate to Charity: Water. Millions of kids around the world don’t live to see their fifth birthday because they don’t have access to clean, safe drinking water. We can help change that. I’m asking for my age (or half my age, or whatever you can spare) in dollars from everyone I know. Every penny of the money raised will directly fund clean water projects in developing countries. Even better, charity: water will show us exactly which projects we funded once they’ve been fully completed (which takes about 18 months). That means we’ll know the locations and names of the communities we helped. If you enjoy listening to librivox audiobooks, would you please consider making a donation to help us with our infrastructure costs? Any donation will be helpful, large or small. And because we are under the wing of the wonderful Internet Archive, your donation will be tax deductible! We have rebuilt all the software that runs our project management systems, our cataloging system, and our book uploading systems; in addition, we’ve done a complete redesign & implementation of our website. All this will be revealed to the public shortly… but there is more work to do. Our 8-year anniversary is coming up, on August 10, 2013. Our target is to raise $50,000 by then. Can you help?